I will even say more. 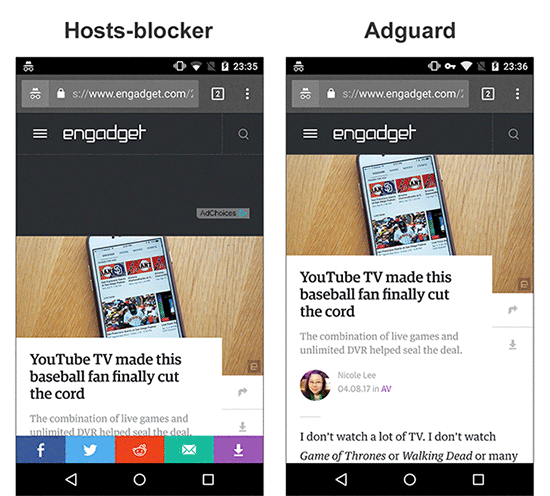 Adguard - not just an ad blocker, but a full-featured firewall. With its help, you are able to take under your control all apps on your device, allow or forbid the network access - as a whole, to a specific server or even a specific file! But let's not rush things and start from the beginning. 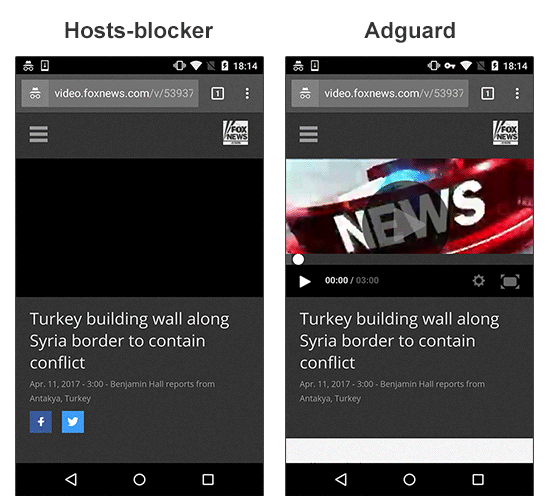 First ad blockers for Android emerged around 2011. At first, they were Adblock Plus for Android and Adaway. Today, the former is almost abandoned, the latter is still being developed but rather sluggishly - it has very little room for development, and I will explain why. In 2013 Android KitKat got released, and along with it the prohibition to change proxy settings without ROOT access. This de-facto killed Adblock Plus for Android. For a long time, the use of ad blockers was limited exclusively to rooted devices. Around this time happened the mass exile of ad blockers from Google Play. 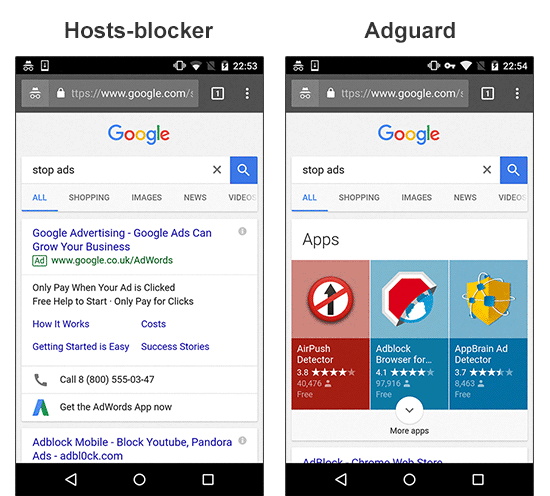 Google had adopted a new policy for apps added to Play Store, which practically turned all ad blockers into 'outlaws'. For the same reason, the very first version of Adguard for Android was kicked out of Play Store in the November 2014, only 5 days after its official release. With time, more and more browsers with built-in ad blocking feature started to appear, but this is a whole different story, and I'll cover it in the next part of this article. What's the difference between Adguard and AdAway? AdAway - is, really, a great and very simple way to block ad networks' domains. What can be easier? You just tell the system that the ad domain is located in a place it can't reach so that all attempts to get to it end up in failure. AdAway does it with the help of a special file called 'hosts' - many of you, probably, know about it. This file contains a list that matches server names with addresses the system should use to reach a particular server. Simplicity. All you need to do - substitute the contents of one file. As simple as it can be. Easy to implement. All that the app should do is to update the contents of hosts file from time to time. The system will do all the job itself. Lack of flexibility. You have no way to manage the blocking. If a domain is blocked - it's blocked, you can't change it. Why does it matter? Sometimes blocking of an ad network leads to breaking the functionality of this or that app or website, and you can do nothing about it. Roughness. Imagine that ads are loaded not from the ad network server, but from a server that is also being used for other purposes. What to do in such case? And these cases are far from being unique. A good example is Facebook ad network (don't be tricked by its name - it is used by thousands of different apps). If you want to get rid of such ads with the hosts file, you'll need to forget about using Facebook apps. Limitations of such approach. Not all ads can be blocked like this. For example, you can't eliminate Google ads without so-called cosmetic rules which 'hide' the banners. 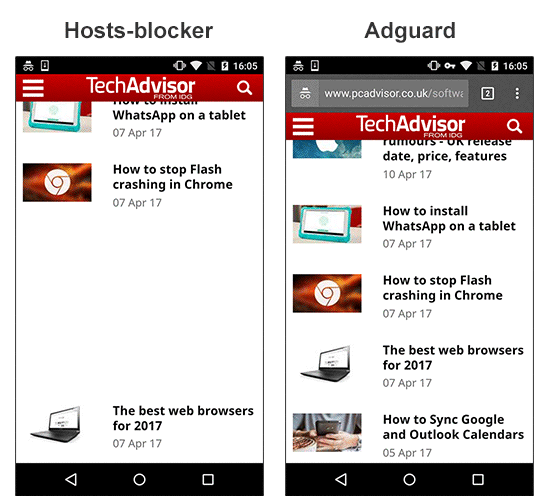 Adguard, on the other hand, is a full-fledged 'filter' that passes through itself traffic of all apps, and then decides what to do with it. These decisions are based on the set of special rules. You can rely on Adguard's own filters or use popular external filters such as EasyList - it's up to you. You can even create your own filtering rules, the detailed syntax description is available in our Knowledge base. Why did we choose this method? The answer is simple - because we can't cope with the limitations caused by the rough approach of hosts-based ad blockers. We firmly believe that every user should have unlimited control over his data and his device, and this doesn't only mean ad blocking. Below I will show on examples what exactly are the drawbacks and limitations we refuse to put up with. It is well known that a picture is worth a thousand words. 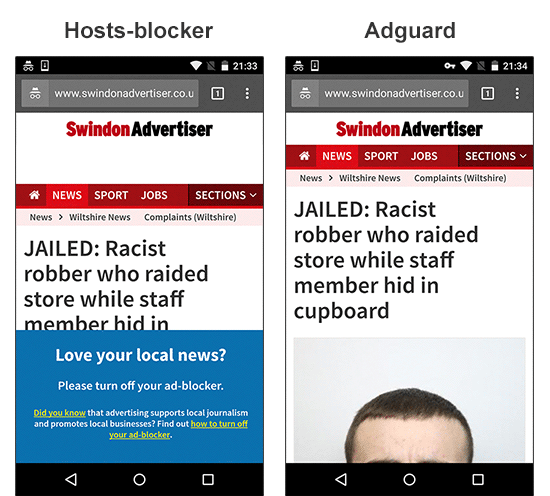 We collected some examples that vividly illustrate the difference between blocking ads with Adguard and with a hosts-based ad blocker. Important: to get the same result it's crucial to enable HTTPS filtering in Adguard's settings. Left side: proof that Google contextual ads can be irrelevant sometimes. Right side: evidence that Google search still has some room for improvement :). Left side: you might have blocked the AdChoices network, but you didn't get rid of the initial ad script loaded from the site's own domain. Hence, half of the page is used for a banner place. I'd also like to draw your attention to the social widget stealing 5-10% of the screen. Right side: the same page processed by Adguard finally lets you focus on content. Left side: the ad is loaded from the Facebook domain. With a hosts-based blocker like Adaway, blocking it means blocking Facebook as well. Right side: the ad is removed by Adguard and you can still use Facebook to tell your friends about it. Situations, when hosts-blocker manages to block ads but ruins the websites readability, are not rare. Blank spaces, ad 'remains' - Adguard removes them from the page content or hides with cosmetic rules. This year the fight against ad blockers takes a new turn. Users get to know about new terms they have never heard of before: Ad Reinsertion, Ad Recovery; some websites experiment with limiting functionality or the access to the website to users who have an ad blocker installed. The rough approach of a hosts-blockers doesn't allow to fight back. Another scourge of hosts-blockers is 'broken' elements. Video players are one of the most frequent victims. By the way, Adguard, besides everything else, is capable of working in many different modes, including the DNS-blocker mode - this is almost the same as what hosts-blockers do. But despite all the difficulties, we have chosen the full-fledged 'filter' mode as a default. This is our principled stance - only users have to decide for themselves what should be blocked and how. Hosts-based ad blockers, sadly, don't provide such possibilities. 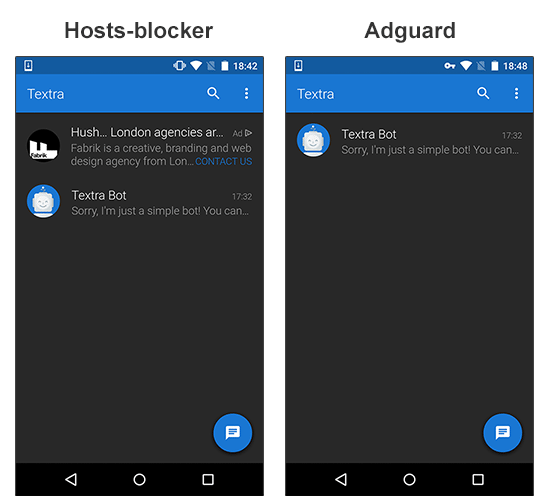 I hope this article clarifies our motifs and demonstrates the differences between the approach of Adguard and other ad blockers on the market. Some of the questions that might have arisen will be touched on in the second part of this article. Or you can ask those questions in the comments, and I or someone else from Adguard team will certainly answer them.